We are at a time in our breed that the future can be shaped. Our future can be whatever we dream it to be. 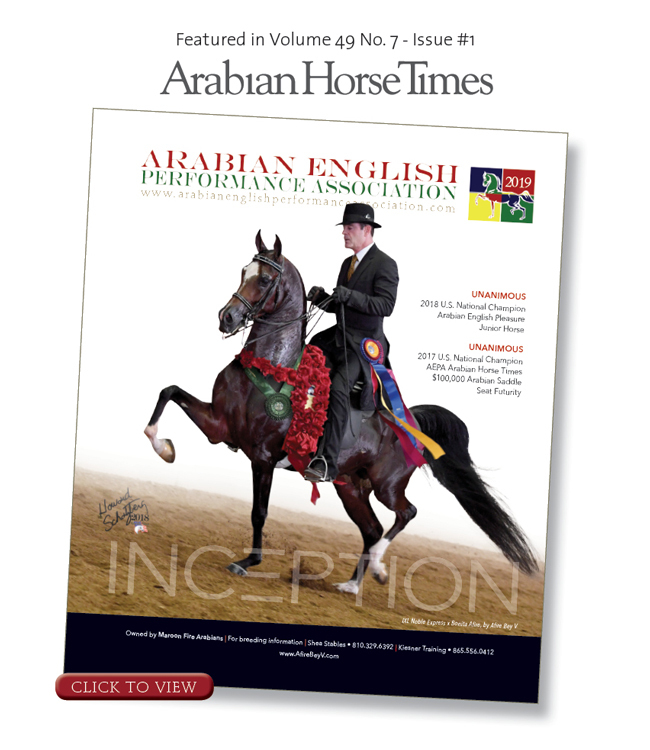 Envision a future that has new owners enthusiastically breeding, buying, and showing Arabian English horses. Huge prize money will generate publicity, add interest, and attract new participants. The judging will be transparent, the results traceable. Most importantly, people will brag to friends and strangers about our wonderful Arabian horses and the exciting things they do with them. THE ARABIAN ENGLISH PERFORMANCE ASSOCIATION MEANS TO MAKE THIS VISION REAL. Created a Futurity class for four-year old purebred Arabians that pays the most prize money ever in an Arabian class ($100,000.00). Created a Purebred Country English Pleasure AOTR Maturity Class for 5 to 10 year olds, that pays $20,000. Developed a judging system that gives numeric scores for the performance of an English horse compared against a standard, and numeric scores for the evaluation of specific attributes in yearlings against standards. Included in all of the classes are individual performances so each horse can be properly evaluated. Set into place an organization and fund-raising system that will insure the integrity and longevity of the Futurity beyond the involvement of the founders. Created a Futurity class for four-year old Half-Arabians that pays ($50,000.00). How are we raising the prize money? Each class is established with a mechanism in place to make it self-funding over the long-term; however for the first five years we are dependent on the financial contributors of people like you – those who love the Arabian horse. They are giving commitments for $500.00 to $15,000.00 per year. This group of dedicated individuals represents a broad spectrum of people that are owners, breeders, amateur exhibitors, and trainers. We welcome everyone’s involvement and ask that you please participate. Someday you will be proud to say, “I was a part of making that happen”. If you would like to be part of the AEPA funding source please contact any one of the individuals on the contact page of this website. The AEPA Stallion Service Auction began in 2007. All horses participating in any AEPA class must be sired by AEPA enrolled stallions. Any stallion may be enrolled, and all enrolled stallions must participate in the Stallion Service auction (with exceptions for stallions who are deceased, sterile, or not standing at public stud). All (100%) of the proceeds from the Stallion Service Auction are retained for prize money payouts. For the first five years they are placed in escrow in order to build a fund that will ensure the success of the program in perpetuity. The AEPA strongly encourages owners to enroll their stallions in the program. The donation of that one breeding to the Stallion Service Auction makes every foal from mares bred that year eligible for AEPA classes. The opportunity to compete for significant prize money as four year olds, and Purebreds again as five to ten year olds, greatly enhances the value and marketing opportunities for all foals sired by enrolled stallions. Please contact any one of the individuals on the contact page of this website for more information on stallion enrollment. All foals of enrolled stallions are eligible to compete in the four year old futurity and Purebreds in the five to ten year old Maturity.